MINI prepared for Silk Way Rally 2018. 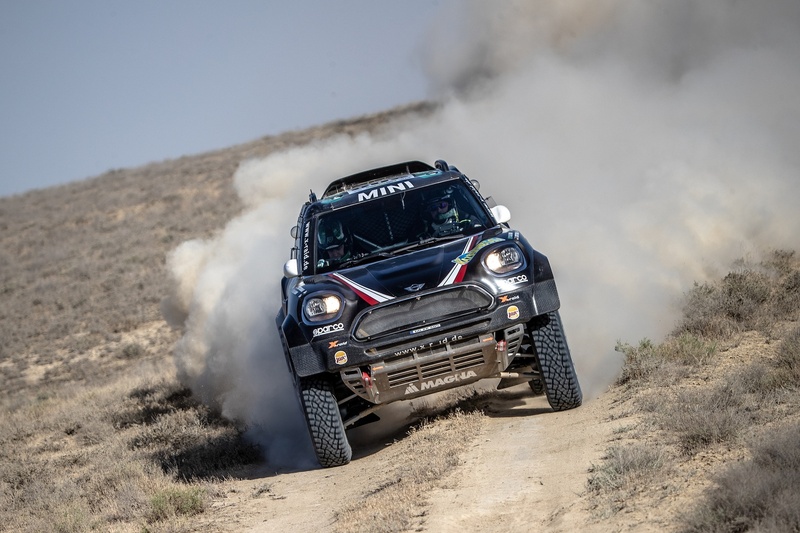 Two MINI crews of Yazeed Al Rajhi (KSA) with Timo Gottschalk (GER) and Joan ‘Nani’ Roma (ESP) with Alex Haro (ESP) will line-up for the start of the 2018 Silk Way Rally in Russia. The podium event will be staged in Astrakhan before the seven-day, 3,570km race begins the following day. Two MINI John Cooper Works Rally line-up for Silk Way Rally 2018. Significantly revised route sees event split into two separate races. First edition of Silk Way Rally 2018 will be contested in Russia only. Unlike the previous edition of Silk Way Rally, this year the competitors will not travel across Kazakhstan to cross the border into China. They will instead complete the race in Moscow on 27 July before contesting a second edition of the rally in China this September. It will be a gruelling start to the rally for drivers and navigators with a marathon stage planned for day two – this means that the competitors will have no overnight support from their team or mechanics during this part of the race. Yazeed Al Rajhi (KSA) is no stranger to Silk Way Rally, having contested the previous two events with MINI and X-raid. In 2016, together with this year’s co-driver Timo Gottschalk (GER), the pair enjoyed success with a second place finish overall, including two stage wins along the way. For 2017, with regular co-driver Gottschalk injured, Al Rajhi was paired with Tom Colsoul (BEL) and the driver experienced a more difficult race. Despite a strong start, finishing fourth in stage one, the pairing faced significant challenges and a resulting penalty on day two, forcing them down to 41st place overall. Refusing to give in though, the pair battled hard and scored a top ten finish overall. However, Al Rajhi is looking forward to returning to the event in the MINI John Cooper Works Rally with his regular co-driver. For fellow MINI competitor, Joan ‘Nani’ Roma, the Silk Way Rally will be a completely new challenge. The experienced rally driver has never before raced in Russia. He will be accompanied in the MINI John Cooper Works Rally by regular co-driver and fellow Spaniard Alex Haro. The race signals the pair’s return to racing following Nani Roma’s recovery from head and neck injuries sustained during the third stage of the 2018 Dakar Rally. For further information on Silk Way Rally 2018 and the full rally schedule please click here.